The restaurant supply superstore stocks Cash Register Paper for restaurants and stores. Our wholesale Cash Register Paper pricing is second to none and we carry top brands of cash paper such as National Checking and Daymark. As a restaurant, you can't afford to run out of register paper or thermal paper. Your whole restaurant operation will be disrupted if you do run out of cash tape. Your business relies on paper records for all transactions. Whether your restaurant device is a POS Printer, Cash Register or ATM, you need a paper roll that is easy to load and delivers consistent, reliable performance. RegistRolls save your business time and money by running 25 to 40% longer than many mail order, dealer and office supply brands. Our paper rolls fit ATMs, POS printers, cash registers and can be used in hotels, casinos, full service restaurants, grocery stores and retailers. 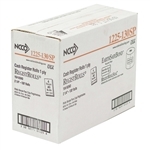 National Checking Carbonless Register Roll 2 Ply - 3 in. National Checking Register Roll 2 Ply Bond White - 3 in. National Checking Register Roll Tape 1 Ply White - 2.25 in. National Checking Register Roll Carbonless 2 Ply White Canary - 3 in. National Checking Register Roll Tape 1 Ply White - 3 in. National Checking Register Roll Tape 1 Ply White - 44 mm. x 165 Ft.
National Checking Register Roll Tape Thermal Paper White - 3.13 in. National Checking Register Roll Tape Thermal White - 2.25 in. National Checking Register Roll Tape White Canary - 2.25 Oz. National Checking Register Roll Tape White 1 Ply - 2.25 in. Evergreen Thermal Register Roll - 2.25 in. x 80 Ft.
Evergreen Bond Register Roll - 3 in. 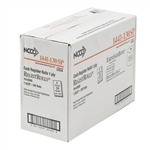 x 165 Ft.
Evergreen Thermal Register Roll - 3.3 in. 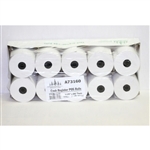 x 200 Ft.
National Checking Register Roll 1 Ply White - 2.25 in. National Checking Register Roll 1 Ply White Bond - 44 mm. National Checking Register Roll 1 Ply Therm White - 2.25 in. National Checking Register Roll 1 Ply Bond White - 2.75 in. National Checking Register Roll 1 Ply Thermal White Bond - 3.13 in. 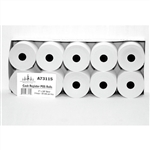 National Checking Register Roll 1 Ply Thermal White - 1.75 in. BPA Free Black Image White Thermal Roll - 3.13 in. x 230 ft. Receipt and Detail Tape - 1.75 in. x 175 ft.
Wholesale Cash Register Paper is used in almost every restaurant and business on earth.